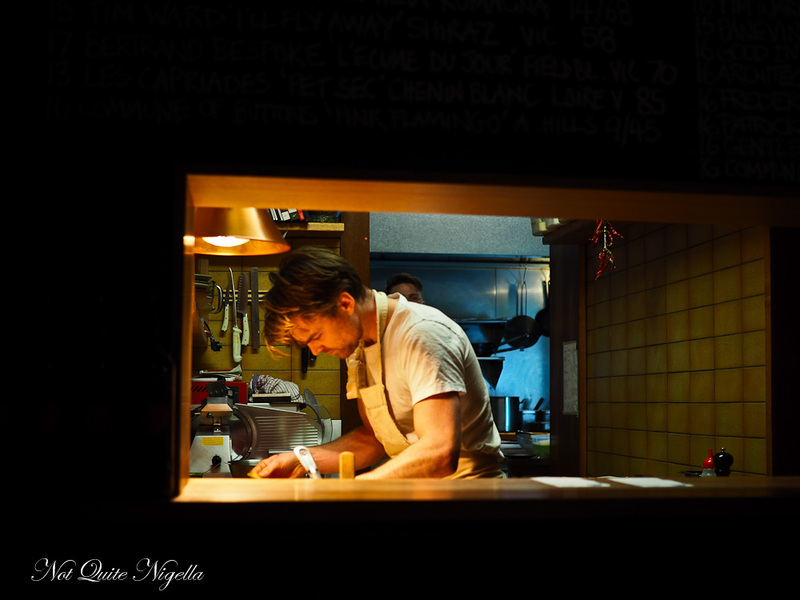 Hobart is a city that has no shortage of places to eat out. From the new to the established to the just plain delicious take a peek at these places that will have you wanting to stay just that little bit longer. From breakfast that isn't just breakfast, to a postage stamp sized wine bar, to dinner with a view and an addictive patisserie you will have all your meals in Hobart sorted out! 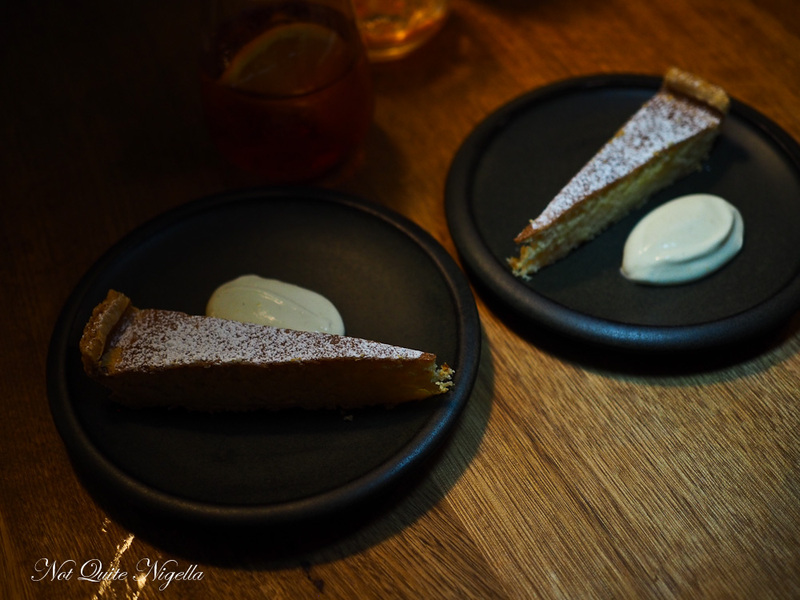 For a breakfast place a little out of the CBD, head towards North Hobart on Elizabeth Street where you'll find Born in Brunswick. 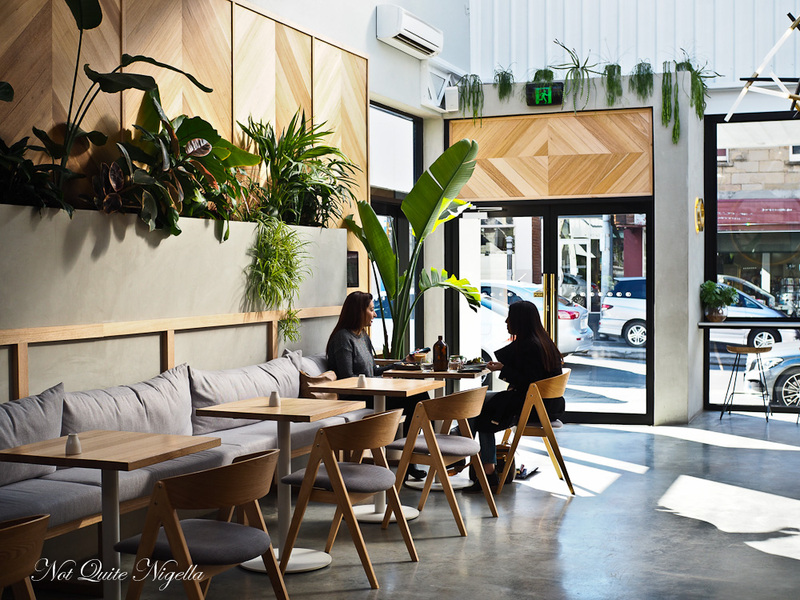 It's a cafe started by a Melbourne couple that moved to Tasmania. The menu is intriguing and unusual-there's none of the usual brunch suspects here. Instead it is filled with creative ingredients like trout fat mayo, Szechuan bbq sauce, kunzea cured yolk and virgin soy broth. We start with Tasmanian juice and coffees. 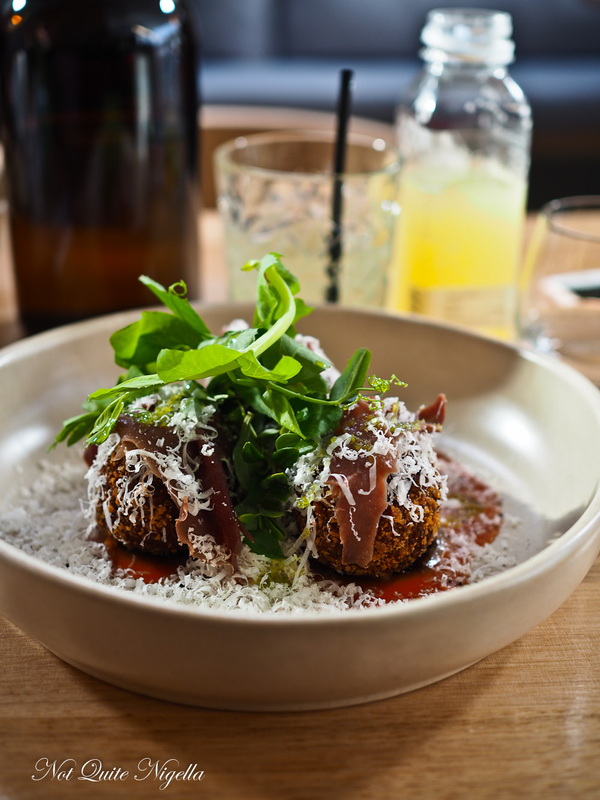 The arancini are a striking dish of three bronzed, crunchy arancini balls made up of the softest wallaby meat with leeks and cornichons. Draped over the balls are sheets of cured venison and there's black garlic, bush tomato and fermented spring onion sauce with fine shavings of parmesan and salad leaves on top. It's a lovely but super rich dish, best suited to lunch rather than breakfast. 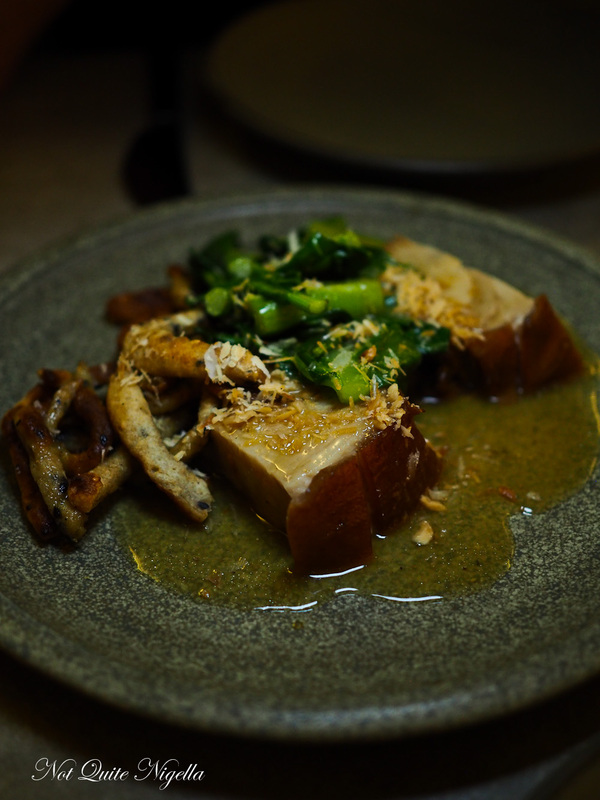 The pine smoked mushrooms are a gorgeous dish with a runny centered slow cooked egg. 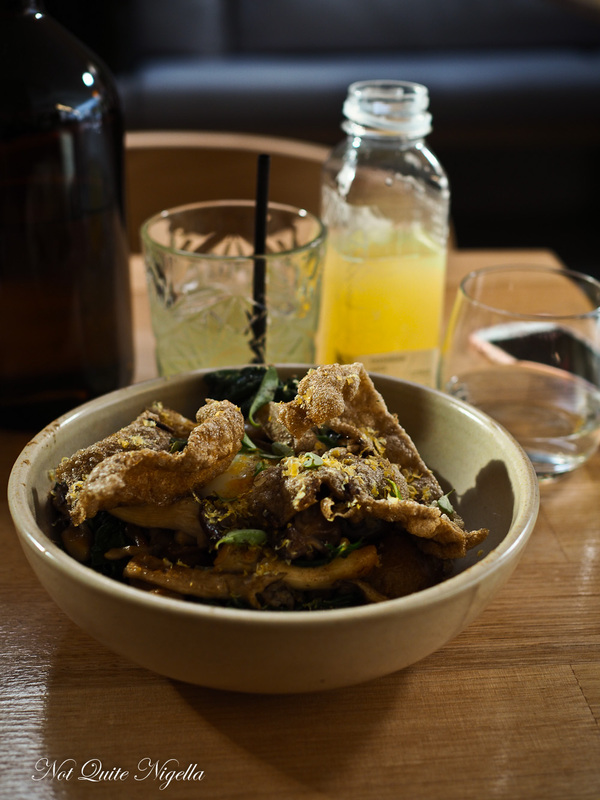 There are sweet cooked braised sunchoke or Jerusalem artichoke, silverbeet and delicious wild rice crisps which I thought was pork crackling at first! It's substantial but doesn't weigh you down after eating it. 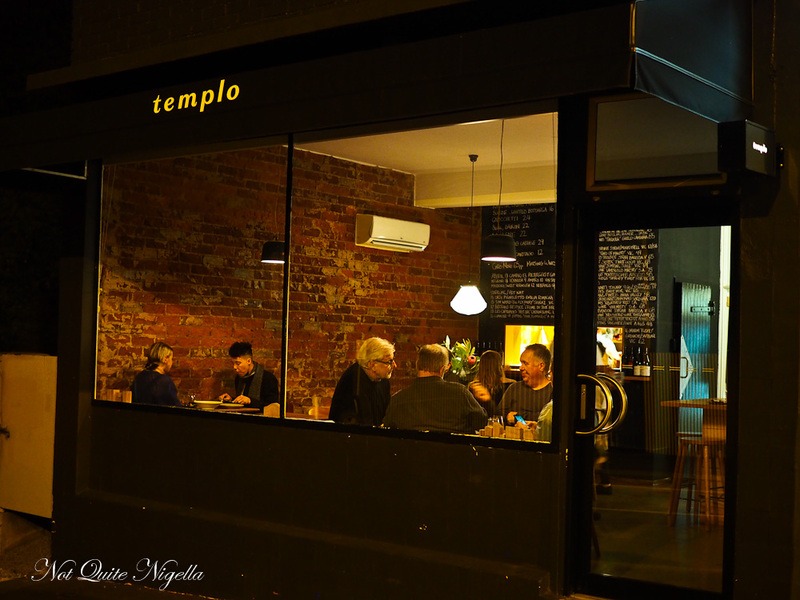 Templo is a wine bar set in the outskirts of Hobart's CBD. 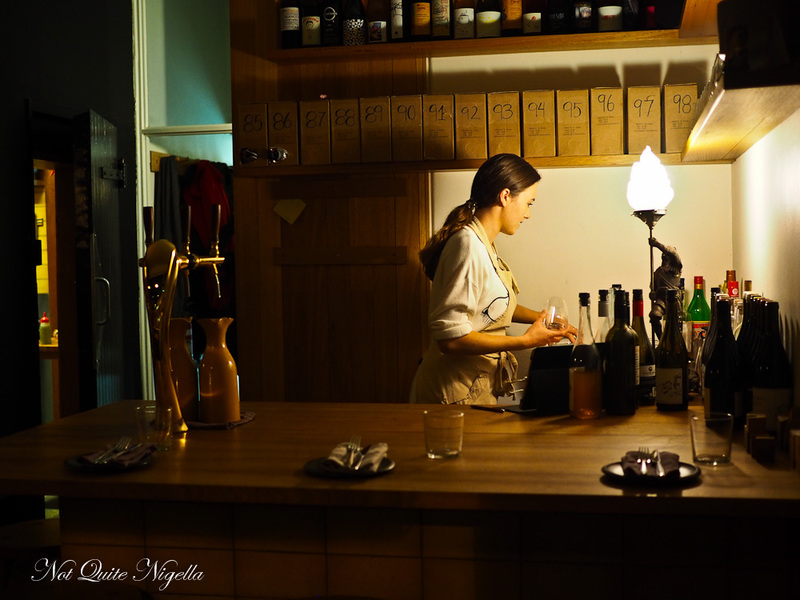 It's a tiny 20 seater restaurant and natural wine bar that pairs an extensive list of Australian and overseas natural wines with a neat but delicious menu of goodies. One thing when dining at Templo is that you need to secure your booking with a credit card. This isn't charged but holds your table as it is a small restaurant and no shows can hurt a small restaurant this size. There are three seating options: the bar, share table or window seat (and you're asked to choose when you book). I definitely recommend the window seats because the bar can be an awkward perch and the share table is tight seating on stools. Service is very sweet and lovely but there is one waitress for the restaurant. 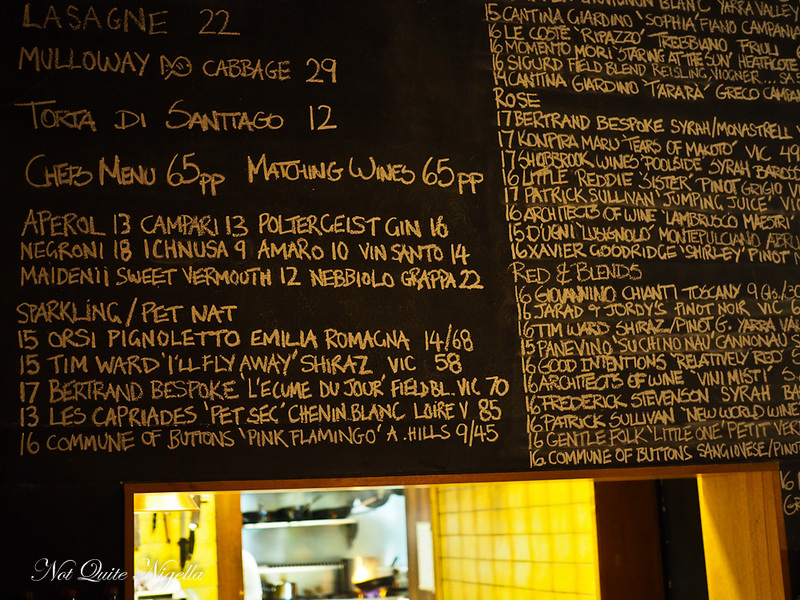 You can either go a la carte or with the chef's menu which gives you everything on the blackboard menu for $65 a person. There are two seatings available although we do see people arriving outside the 6pm and 8:30pm times. Chefs Matt Breen and Chris Chapple are cooking tonight. The gnocco fritto is something that I had a lot of while in Emilia Romagna. It's a specialty of Parma and is essentially fried dough draped in prosciutto. Although it isn't quite as light as the ones we had in Italy it's a good start to the evening. As a vegetable lover I'm delighted to see all of these vegetable courses. 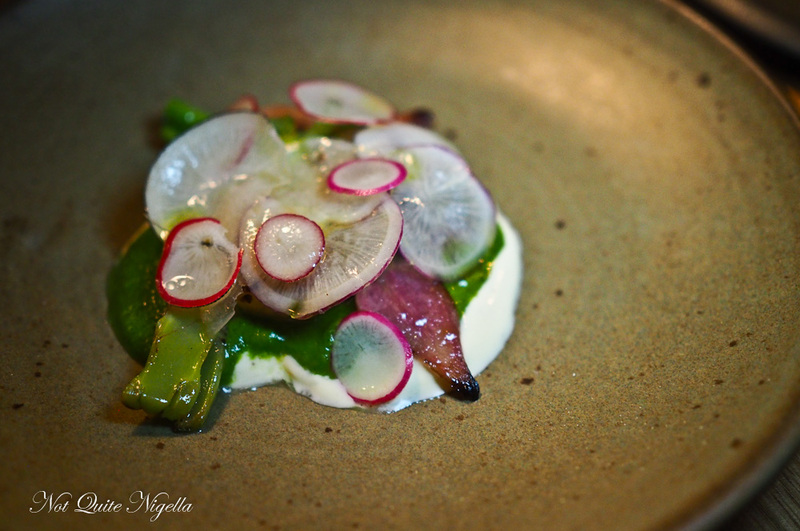 This one is a beauty with halved and thinly sliced radishes, a herb sauce and creme fraiche. 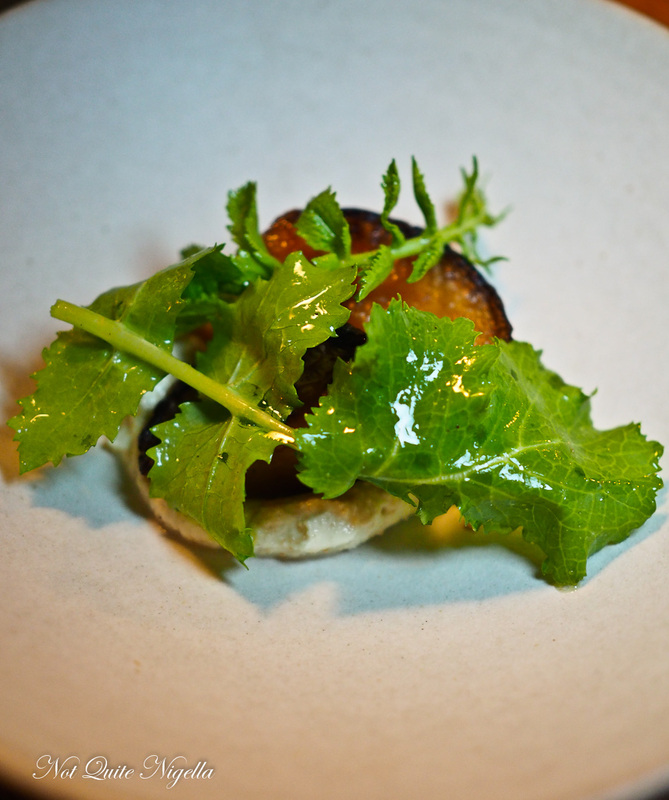 It shows you how gorgeous vegetables can be and how full of flavour they can be too. I think this was my favourite course which is odd because there were so many other good ones that I thought that I'd go for. It's a piece of roasted swede with toasted seeds and a creamy whipped bottarga that reminds me of taramasalata, a spread that I am powerless to resist. 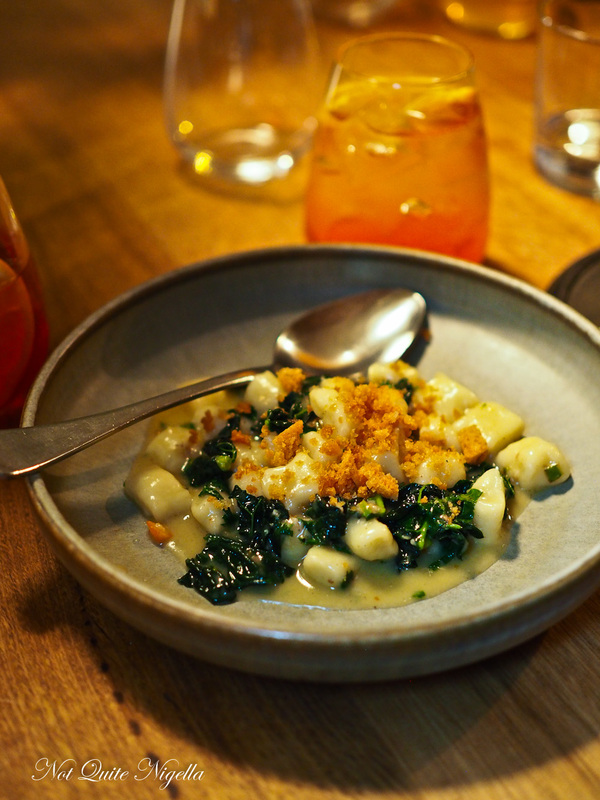 The gnochetti is small, tender potato gnocchi with a cavalo nero and crunchy pangrattata on top. The cavalo nero or Tuscan kale really makes this dish along with the rich garlicky flavour. There's a bit of a change of pace with the quail. 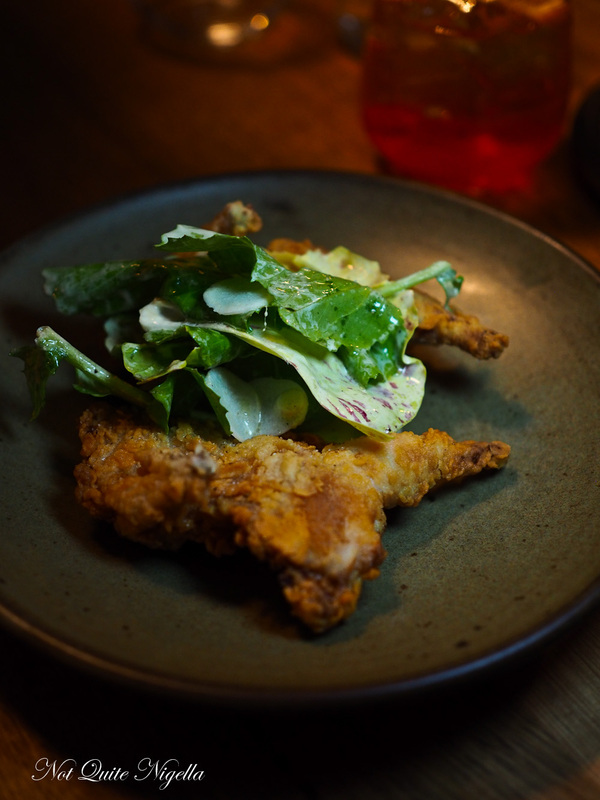 It's KFQ or Kentucky Fried Quail, two quail legs coated in a crunchy batter and deep fried with a buttermilk dressing, a bit of salad and thinly sliced daikon. The lasagna tonight has slow cooked beef on top with a slightly crispy edge to it. It needs a touch of seasoning but it's comforting and comes with some radicchio, hazelnuts and a verdant olive oil. 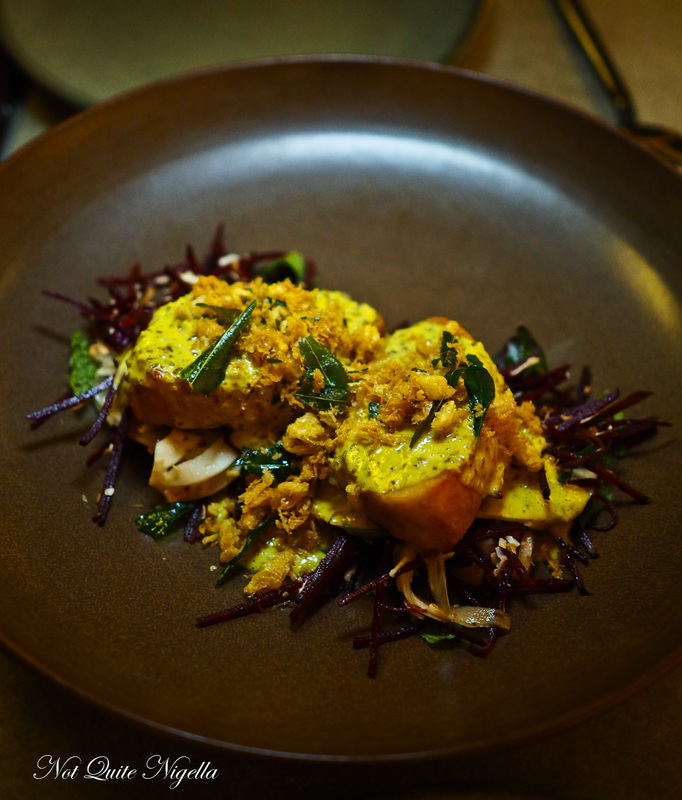 Perhaps the only dish that I both didn't love as much as the others is the mulloway cabbage. 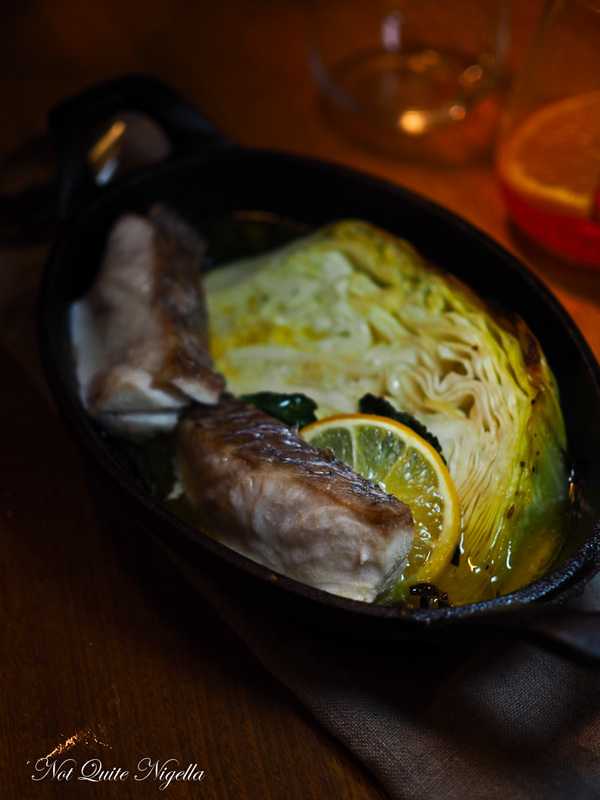 Mulloway can be a tough fish and the cabbage is a mix of different flavours with a soupy broth. Overall the dish is a bit oily too. 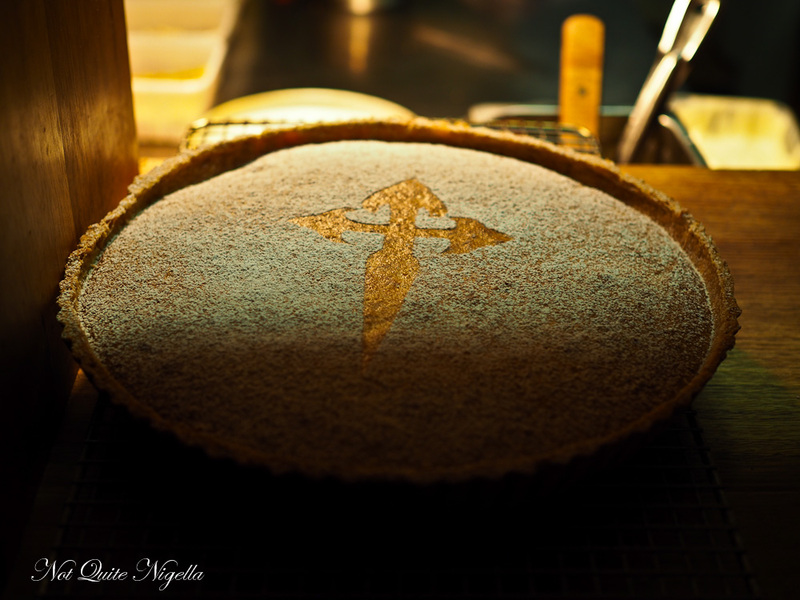 The dessert is a thin slice of torta di Santiago, a cake that was popularised in Santiago. It has a cross on top in the icing sugar dusting and it's an almost cake, a touch dry but perhaps that's what the creme fraiche is for. 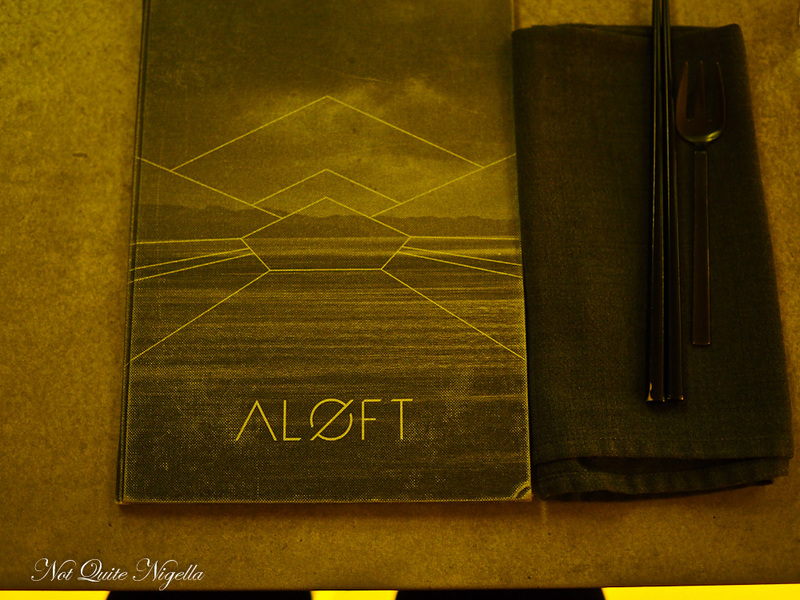 One of the best meals I had in Hobart was at Aloft, Sullivan's Cove. 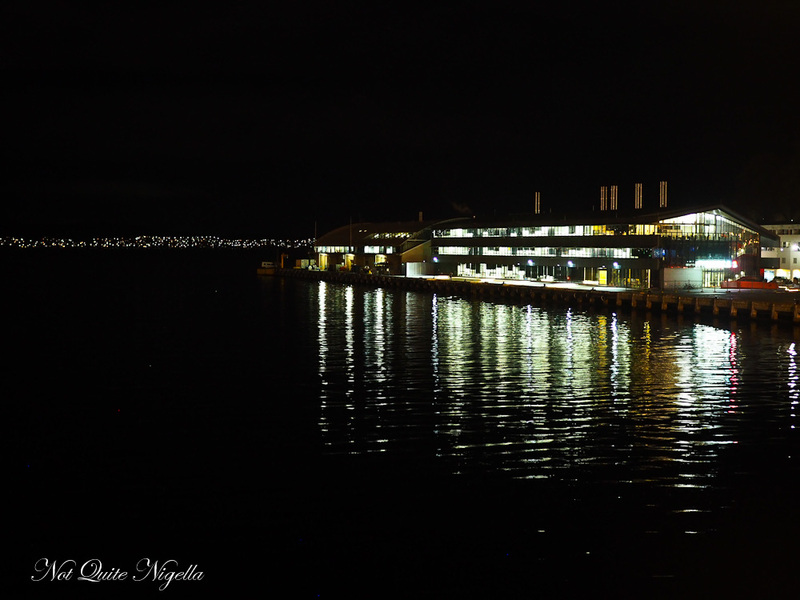 Aloft is located on the top attic floor of the Brooke Street Pier building, a four storey pontoon where the ferry to MONA leaves. Usually where there is a view there is not usually great food but not so in this case. Chefs Christian Ryan and Glenn Byrnes are formerly from the now defunct Garagistes. Again the banquet menu seems popular but as we've been eating all day we decide to share a couple of dishes. There's no attitude or problems from the delightful staff here at all. 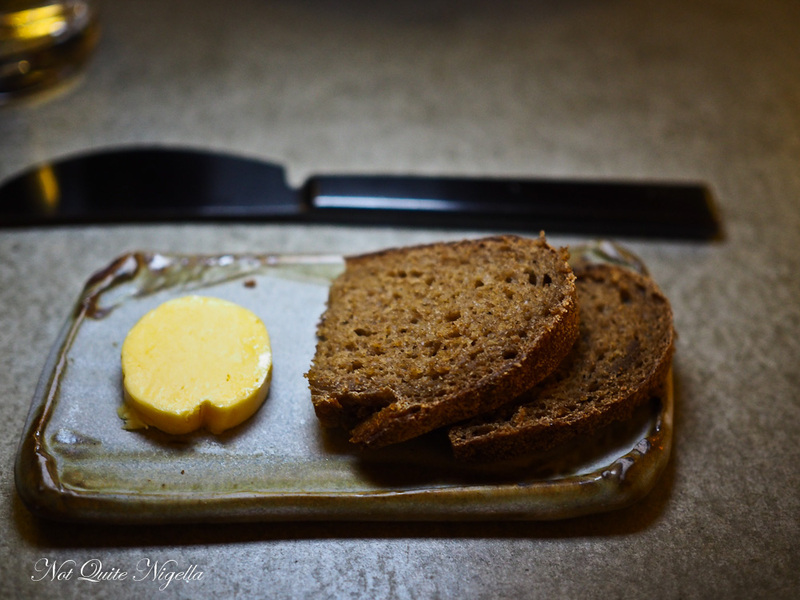 We start with some delicious Pigeon Whole Bakery bread spread with smoked miso butter. I should also mention the lovely cutlery used during the dinner too. 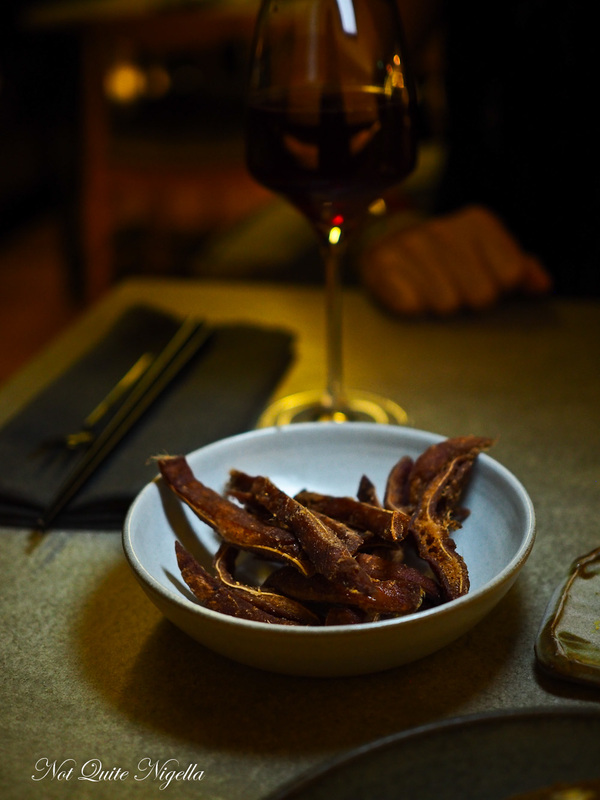 The pig's ear is said to be one of the more popular dishes and I can see why these little morsels or beer snacks are best eaten with chopsticks, each knobbly piece succulent to the bite with the flavour complexity of masterstock. We see a lot of these wings coming out to tables. 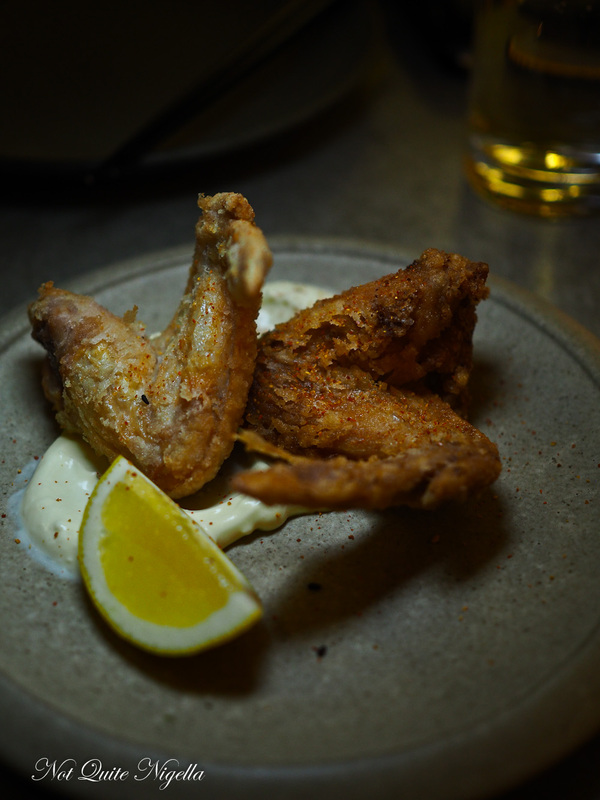 The drunken part refers to the wings being marinated in shaoxing cooking wine and they're crispy and piping hot with a creamy buttermilk sauce and lemon. The marinade permeates the skin and meat very well giving it so much flavour. When we ask if the curry needs rice they explain that it isn't a curry as such, more curry flavours with a bit of sauce. And when they bring it out we can see why. The fish is wonderful-succulent and soft and sings with flavour. 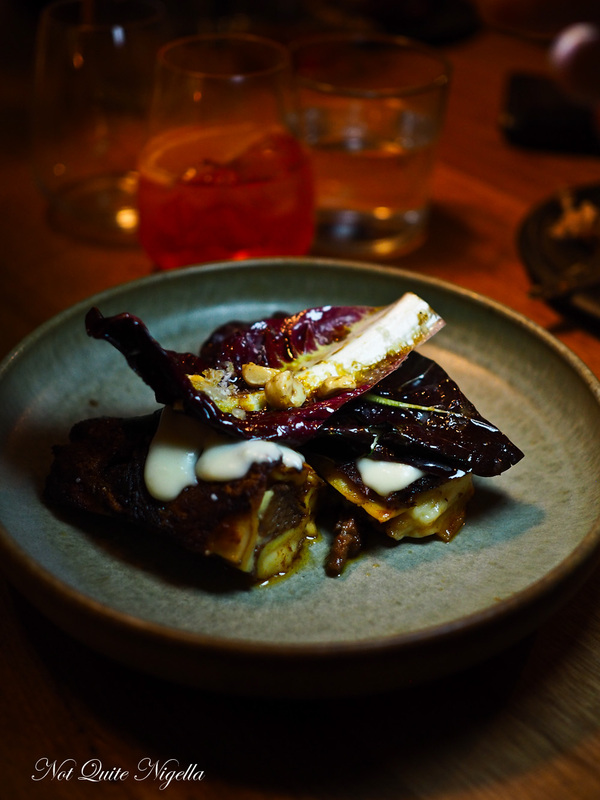 It sits on a bed of grated beetroot and fennel with crispy egg floss on top and the whole dish is so wonderful that we are suddenly possessed to order another dish just to try more. The other dish is a succulent roast pork shoulder that just cuts like a dream and melts in the mouth. 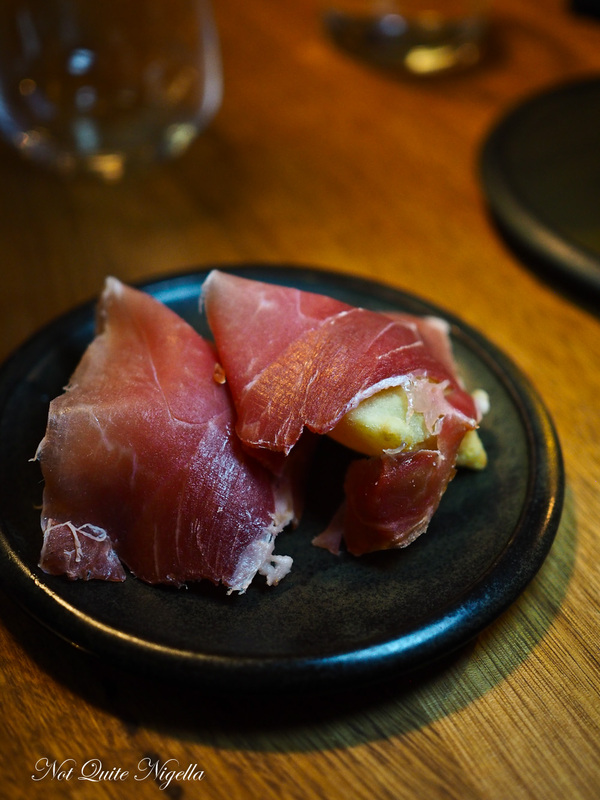 It is fatty yes as it is the shoulder but it's topped with an intensified ramen broth, resounding in porky flavour. The sesame spatzle honestly we could take or leave but the sauteed greens are topped with a divine miso caramel that gives it an unexpected sweetness. And last but not least is the dessert, one of a choice of three. 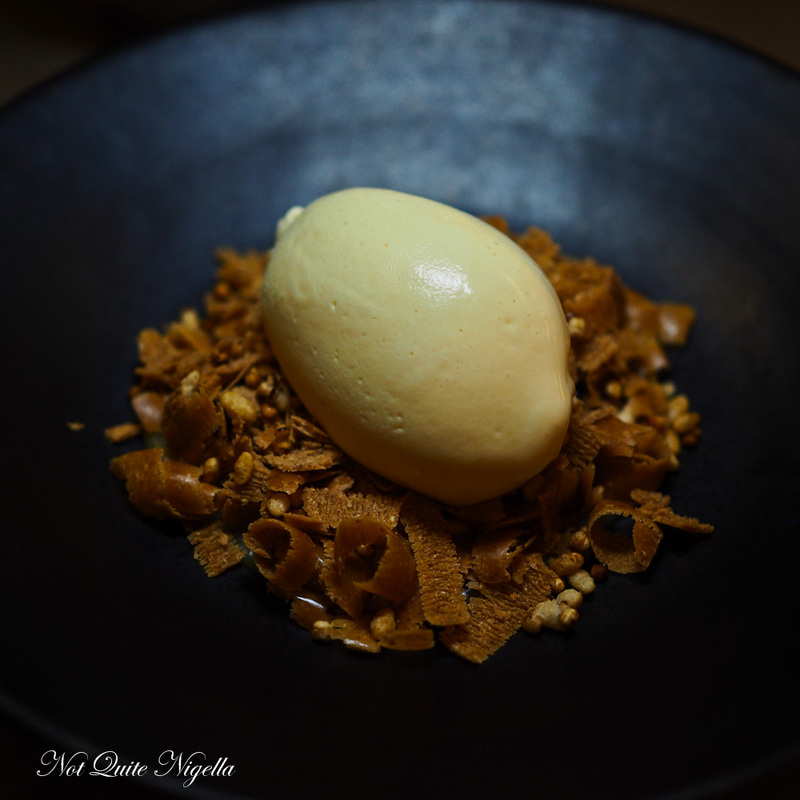 In the centre is a lusciously silky condensed milk ice cream and around it sits candied grains, salted caramel coffee syrup as well as a shaved sable biscuit that has been blended with burnt butter and then shaved. It's said to be a twist on a Vietnamese coffee. And you know what? It's fantastic. Pastry chef Alistair Wise, his bakery and their divine concoctions make choosing cakes an almost painful experience. 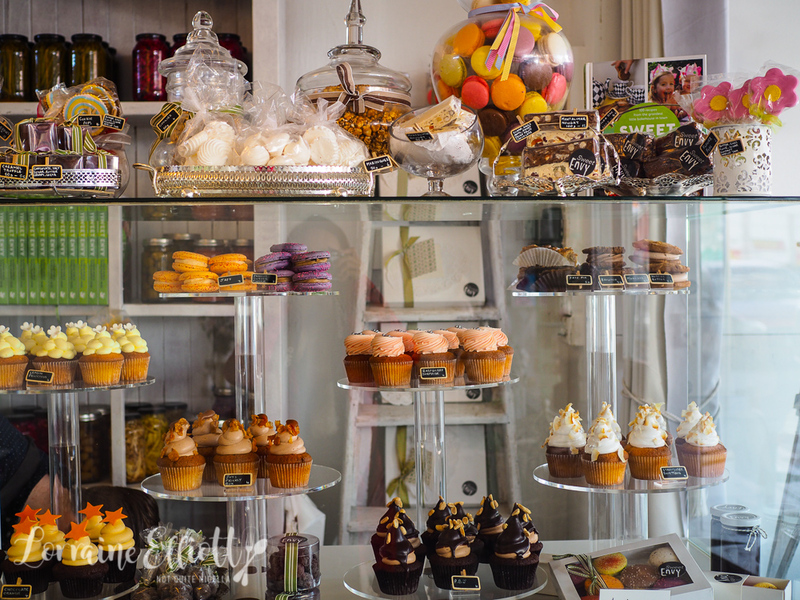 Just give over to your cravings here whether it be a plump cinnamon bun soaked in syrup, a cupcake, macaron or elegant cake. 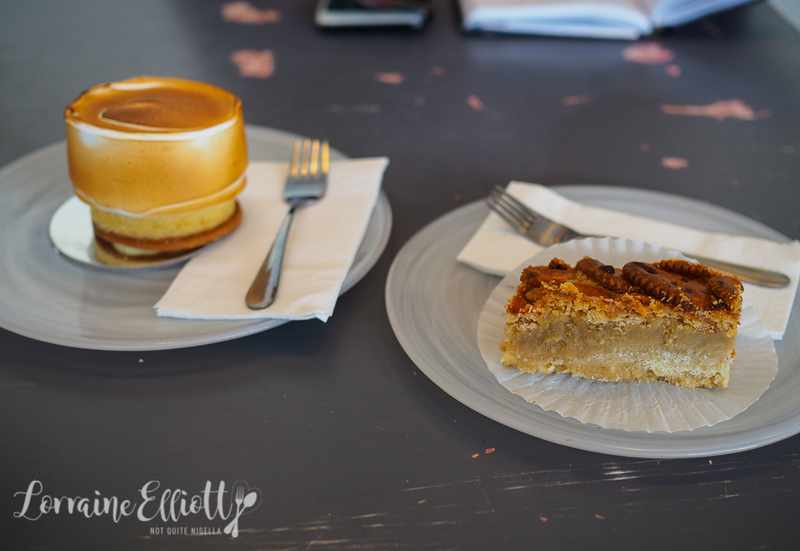 Or try their famous Jatz Pie, a rectangular slice of caramel, peanut butter, salted caramel and Jatz biscuits that is a must try. It's located right near Born In Brunswick so if you're headed there for breakfast, pick something up to have for later. So tell me Dear Reader, when you travel, do you plan out your meals in advance or do you wing it? Which place of the four appealed to you the most? These meals were all independently paid for.